Visit Our 10,000 Sq. Foot Showroom Our 10,000 square foot showroom in Wildwood, Florida is one of the largest in Central Florida. We offer you one of the area’s most complete selections of designer cabinetry, countertops, custom showers and more – all at unbeatable lower prices. Superior Selection of Cabinetry We offer all the newest and most popular styles of kitchen cabinetry for all tastes and budgets. We carry an extensive selection of better quality lines of cabinetry that are sure to please, and can help you achieve any specific design look that you desire. Lowest Prices in Central Florida No one beats our prices on superior quality lines of designer cabinetry, countertops, showers, bathtubs and related accessories. We consistently offer the area’s lowest prices on the products people want, and we back our sales with knowledgeable service. Prompt, Professional Installation Our professional installers are among the most experienced and best in the business. We’re perfectionists in everything we do and strive to provide service excellence that goes above and beyond what you typically encounter elsewhere. Beautiful Countertops We specialize in countertops. 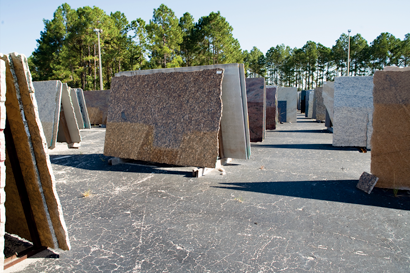 With more than 120 colors and 600 slabs of granite in stock, we offer one of the largest granite selections in Florida. Plus, we offer lines of quartz, solid surface and laminate countertops by the world’s best name brands. Custom Showers - No Grout Lines We’re the area’s leading manufacturer and installer of custom Terra Stone Solid Surface Shower bases and wall material. Our showers have NO grout lines to clean, and feature a sanitary, non-porous surface that’s made of durable one-piece construction. Both custom and standard sizes are available.